Post-feminisms have deconstructed traditional feminism that did not speak of women, but rather of the woman as a specific entity; it did not take into account the diversity of statuses and sexual orientation of transgendered women and men, as well as cisgender and intersex individuals. All over the world, feminists assert themselves. Despite the accessibility of their speeches on the internet, their scope is not completely effective. We can wait no longer. If History could be rethought and rewritten from an inclusive point of view, what would the resulting narratives be? If the history of art could be considered in an egalitarian manner between artists, whatever their gender is, what would the narratives be? 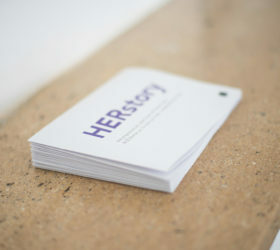 We have chosen to bypass History to suggest new narratives, new voices and new archives: HERstory. We, artists and art historians, wish to be engaged to render visible, circulate and archive feminist speeches. Supposed to be an inventive, subversive and progressist territory, art, just like society, witnesses a delay that is impossible to disregard. HERstory is a platform for queer feminist reflection, a platform for expression, exchange and creation of archives. 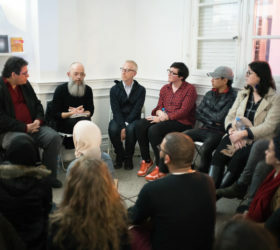 It is a space where the words of men and women intercross, being cisgender, transgender or intersex to come to an end with the hyper simplicity of gender binarism. Most of the time, feminism does not have a good reputation and common belief persists: ” we do not wear makeup, we do not shave, we are always angry, we have no sense of humor, we do not use deodorant.” Thanks to internet, speeches and writings from different cultures and geographical areas are made accessible; however, the problem of language difference hinders theoretic development. HERstory tackles this problem through the means of translation. 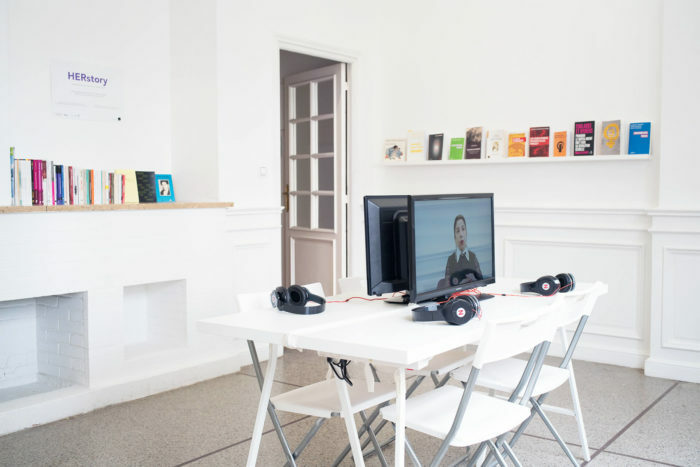 In room 3, at Le Cube, excerpts of conferences and self-expressions, affirming a plurality of feminisms and a strong will to diverge from a mono-feminist discourse are screened. 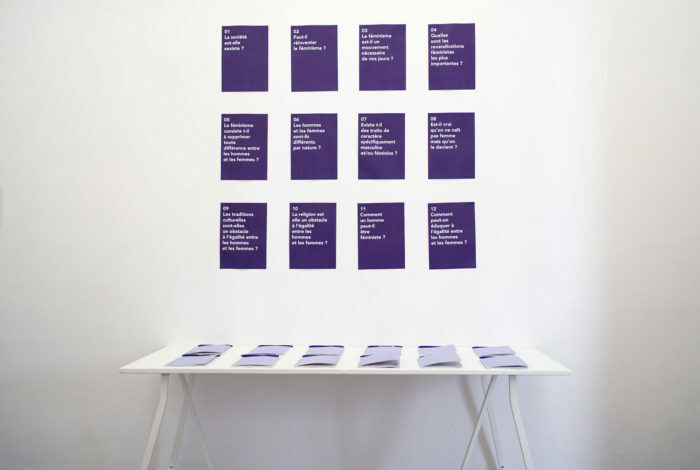 Chandra Talpade Mohanty (India) evokes a transnational feminism. Cordelia Fine (Canada) reflects on what she calls the Neurofeminism. Jessica Yee (Mohawk d’Akwesasne) tells us about native Indian-American feminism. Ye Hayian, Ai Xiaoming and the Five feminists inform us about their struggle to get their rights in China. Zahra Ali speaks of the stakes of islamic feminism in France and in the world. Through the creation of the notion of intersectionality, Kimberlé Williams Crenshaw reflects in a crossed manner on systems of oppression of class, race and gender in contemporary America. 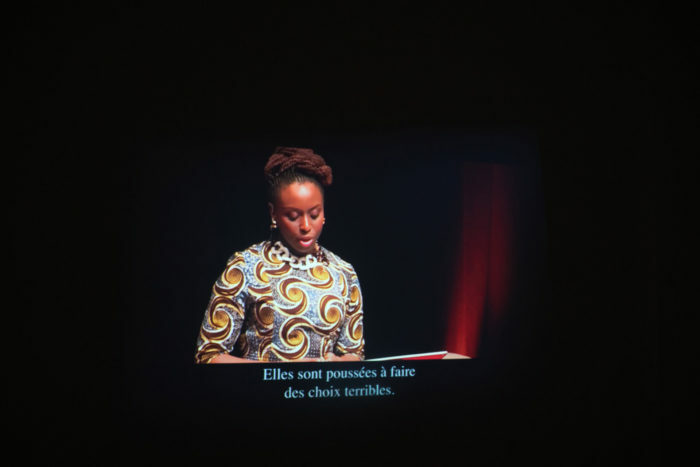 All of the speeches are translated in French. 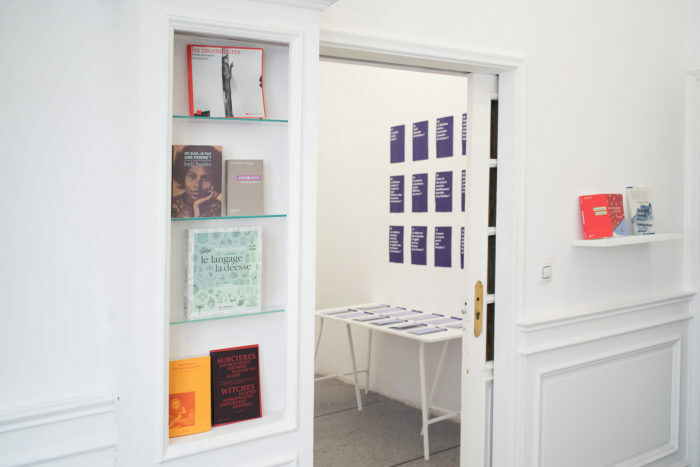 At the entrance of the exhibition, visitors have access to a feminist library composed of books testifying of a dynamic, critical and global engagement. 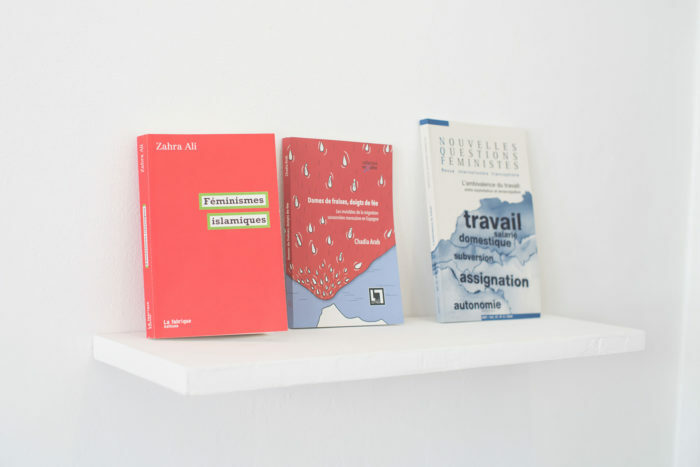 In the end of the exhibition, the books offered by several publishing houses will become part of the media library of the art center. Thus, the latter will also benefit from a theoretical background with references coming from different continents. 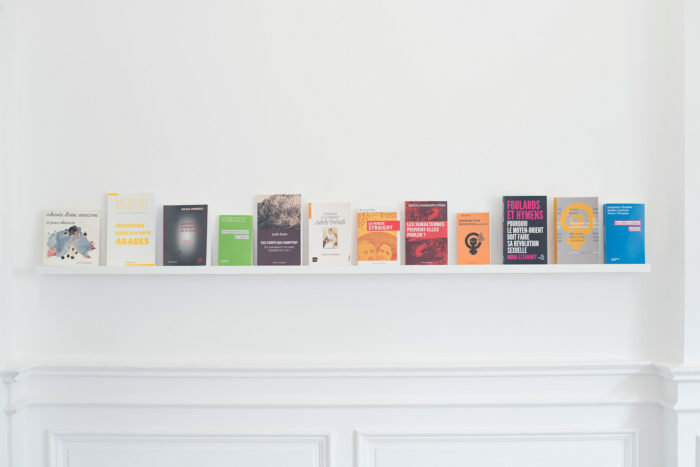 The videos and books incite to enlarge the theoretical framework of feminist thoughts. As days go by, artists, women and men, join us to discuss not only their practices but also their position in relation to feminism. 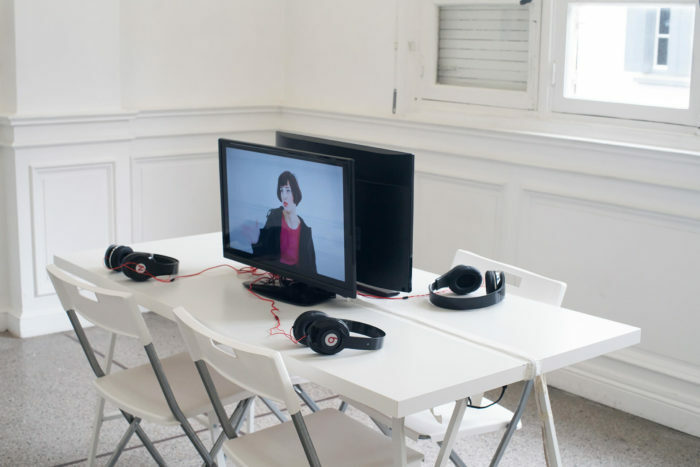 The interactions are filmed and diffused in the art center and on the internet. The creation of archives is ongoing. HERstory is an invitation to watch, hear, read, inform, discover, exchange, meet, propose, debate, interrogate, and open up to postfeminist thoughts. 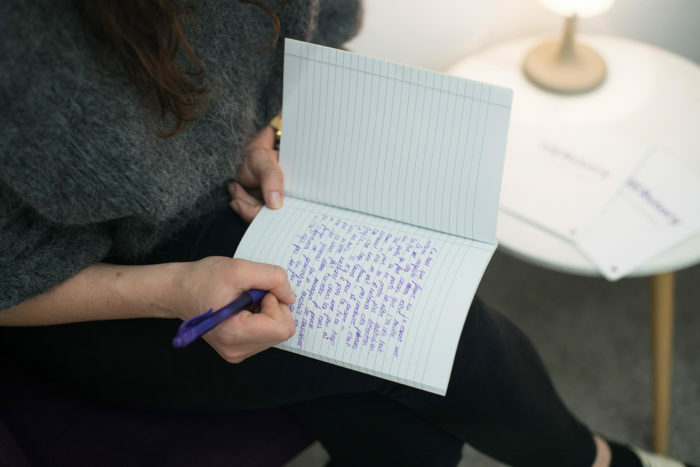 From one day to the other, these extremely prolific thoughts enlarge and oppose each other, get more precise and refined. They are thoughts that need to circulate in order to generate a pluralistic vision of our society. 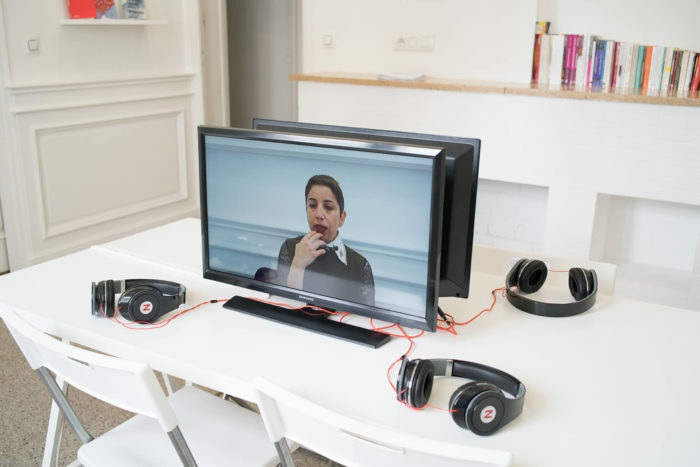 "HERstory", vue de l'exposition curatée par Julie Crenn et Pascal Lièvre au Cube - independent art room.